With unrivalled and incomparable self-illuminated brightness, its Gaseous Tritium Light Source (GTLS) created such a significant revolution in the history of military watches that the illumination technology not only became a de facto standard in timepieces made for military usage, but also for outdoor and casual scenes. Despite this, Traser was relatively unknown to the public compared to other more well-marketed renowned brands, many of which use the same GTLS for illumination. This relative "anonymity" was perhaps due to the fact that the brand had been very focused on producing and supplying watches specifically to the military, and therefore widely known only by the "inner-circles". MIL-Spec (MIL-PRF-46374G) qualified, robust, no frills, no gimmicks, the brand's authentic military watches have simple and purpose-built designs, even the logo was done away with. Between 1990 and 2000, over one million Traser watches were supplied and issued to the U.S. military forces. An impressive track record that testifies to its superior quality and performance. 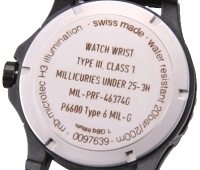 Traser is the brand of the Swiss company MB-Microtec who developed GTLS, but it was the then American military watch contractor Stocker and Yale that produced the first military watch using MB-Microtec's GTLS, the original P 5900 Type 3. In 1988, the U.S. Army discovered that the traditional tritium phosphorescent paint used on the hands and markings on the dials of the watches supplied at that time were emitting an unusually high dose of radioactivity. This caused the MIL-Spec to be revised and the usage of tritium phosphorescent paint was promptly prohibited. At that time, Stocker and Yale had been supplying the army with compasses equipped with MB-Microtec's GTLS for illumination and proven to be safe and not release any measurable radiation whatsoever. The company wasted no time to apply this technology watch lighting. Despite the success, the watch division of Stocker and Yale was sold off in 2000 and MB-Microtec inherited the brand and continued its production and marketing ever since. 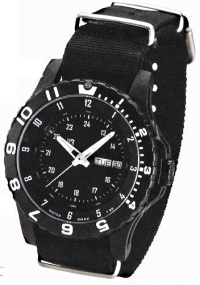 Following the success of P 5390 Type 3, the first military watch equipped with GTLS illumination and supplied to the U.S. Army since 1991, the P 6500 Type 6 Navigator was subsequently created and issued to U.S. troops in 1995. 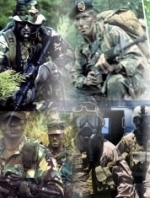 Type 6 Navigator went on to become the standard equipment of Special Operations Units such as the Army Rangers , Army Special Forces (Green Berets) , Navy SEALs and EOD Teams . It became very popular with the troops and also one of the most desirable collector's items for those who collect military memorabilia. The successor of Type 3. Developed based on the latest MIL-SPEC version MIL-PRF-46374G. No frills, no gimmicks, mission oriented. Even the logo is done away, evidence of its true military watch identity. Double case construction comprising inner steel and outer glass fiber ensures that the even most demanding environment won't be a concern. Swiss company MB-Microtec developed Trigalight® - air-tight micro-capsules filled with tritium gas - that is more than 100 times brighter brighter than traditional luminous paint or coating. Its illumination is guaranteed to last over 10 years, and more than 20 years over its entire lifespan. Before tritium was allowed to be used as self-powered lighting, radium was used as the main source of luminous paint. The toxity and harmful effects of radium were soon realised and it was replaced by less hazardous tritium. In 1988, however, the New Cumberland Army Depot, Pennsylvania, discovered that its large stock of watches, coated with traditional tritium phosphorscent paint, were emitting unusually high dose of radioactivity and therefore a security and health risk. The U.S. Department of Defense immediately revised its MIL-Spec to address this issue requiring all military watch suppliers to comply. It was at that time that the self-illumination technology of MB-Microtec, which was already used in compasses supplied to the military then, was used to create the first military watch equipped with GTLS. By laser sealing tritium gas into air-tight and gas-proof micro glass tubes coated on the inside with luminous (phosphorescent) substance, it presented no external radiation threat due to tritium's low penetration depth, which is insufficient to penetrate human skin and can be stopped simply by a sheet of paper. Tritium lighting is legal in most countries but regulated by respective safety standards that most watches using GTLS are able to comply. 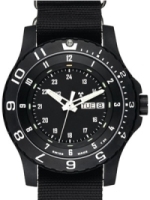 For example, MIL-Spec allows only dosage of below 25mCi (millicurie) and Japan's safety standard requires below 925MBQ (megabecquerel) and a "T25" marking on the watch dial. Both mean the same thing since 1mCi = 37MBQ.